In Lewistown, Mont., A Creek Runs Under Main Street Main Street in Lewistown looks like a postcard with its barber shop, soda fountain and old movie theater. But below the street runs Spring Creek — the scene of a rite of passage for many of the town's residents. Independent producers explore new ways to blend public media with the digital space. Main Street in Lewistown looks like a postcard with a movie theater, a barber shop and a diner where old men meet for coffee every morning. But it also has some hidden features. 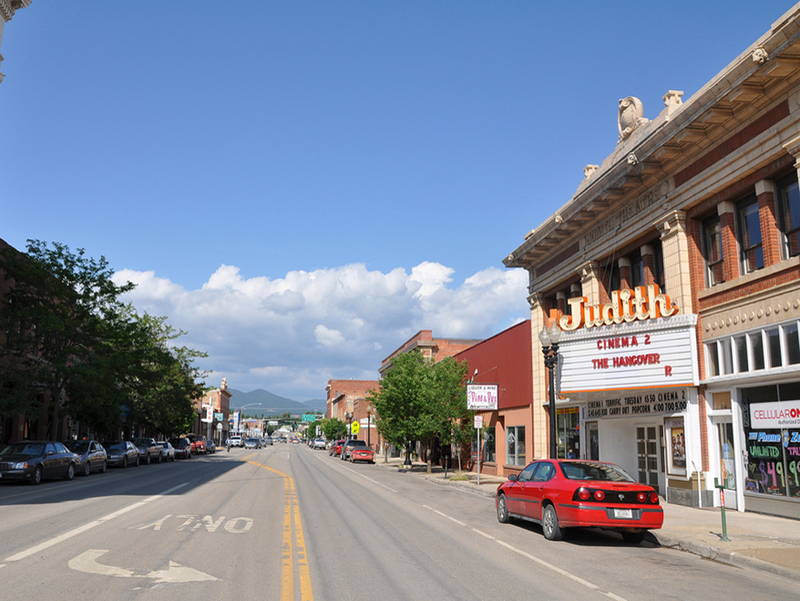 Main Street in Lewistown, Mont., looks like a postcard with its barber shop, soda fountain and old movie theater. But below the street runs Spring Creek — the scene of a rite of passage for many residents. "Back in the day, when [Lewistown] was built, it was kind of just like a boomtown," 18-year-old Felicia Alaers says. "You know, that's why they're boomtowns, they kind of get big and die out, and Lewistown, like, kept going. So good for us, I guess." Felicia has lived in Lewistown her whole life. She just graduated from high school and spends much of her time working at Pizza Hut, hanging out on Main Street or playing beer pong. "I always win at beer pong," she says. "Well, no, I lied. But I did last night!" Mines once made it a boomtown, but Lewistown's population is now about 6,000 — and Felicia seems to know all of them. She sits on a bench on Main Street and says hello to everyone who passes by. To Pete the UPS man; Dalton, the 15-year-old who just got his license and cruises up and down the street eight or nine times; Mikey the Pizza Hut delivery driver. It's just part of living in a small town. "Main Street is the only place where there are people in this town. If you drive on the other streets, it's like, where is everyone? Main Street. It's the only street where there is anything going on," she says. Felicia says the best part of living in Lewistown is the creek. It's a natural artesian spring and it flows right through town. "In the summertime, I don't even shower. I just take my shampoo to the creek, if you want to get technical about it," she says. But the creek isn't all above ground; five blocks of it run under Lewistown. When the town was constructed, part of it was built over the creek, inspiring a unique thrill ride that has become a rite of passage: floating through the town, underneath Main Street, in the pitch black. "It's not that bad," Felicia says. "Last time I was under there, there's just, like, rats under there, so if you really get freaked out by rabid animals ... but I don't think they're going to hurt you at all. Like, I survived and I've done it, like, five times, so I think it'll be fine." For those who want to see the creek without dealing with spider webs and rodents, there's the Montana Tavern, which also gets points for serving the favorite local drink, Crown Bull — a delectable combination of Crown Royal and Red Bull. A modest sign reads: "The only bar in central Montana that runs over Spring Creek." Unlike signs that claim the "Best Pizza in N.Y." or "Best Burger in Texas," this statement seems indisputable. 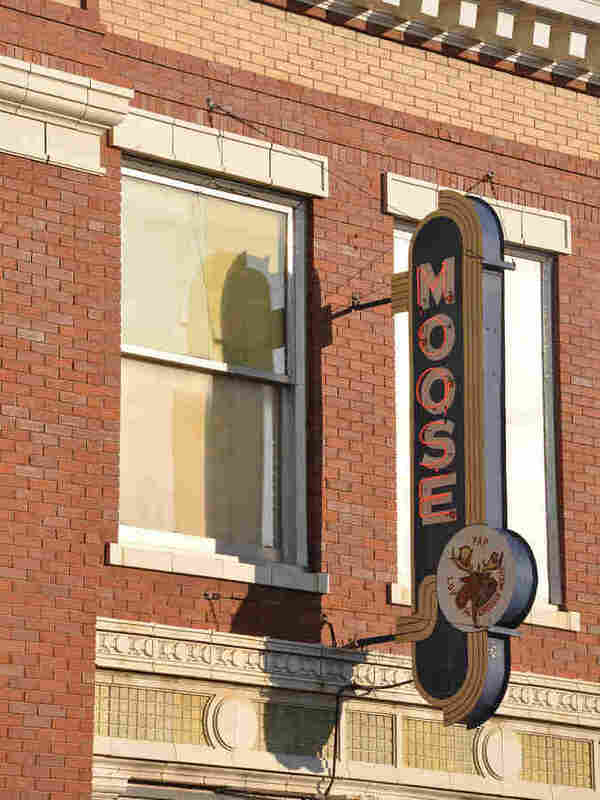 Tom Macomber was on his way to the Moose Lodge on Main Street when the bus hit him. Inside the tavern's front door, visitors might notice the big cutout in the floor allowing a view of the creek. The original owner allegedly built the hole so he could fish while he worked. Then people started using the hole for other purposes. According to David Collison, tavern regular: "People used to come in here after the bar closed and float down the river and steal booze." Now, there's a lock on the hole in the floor. 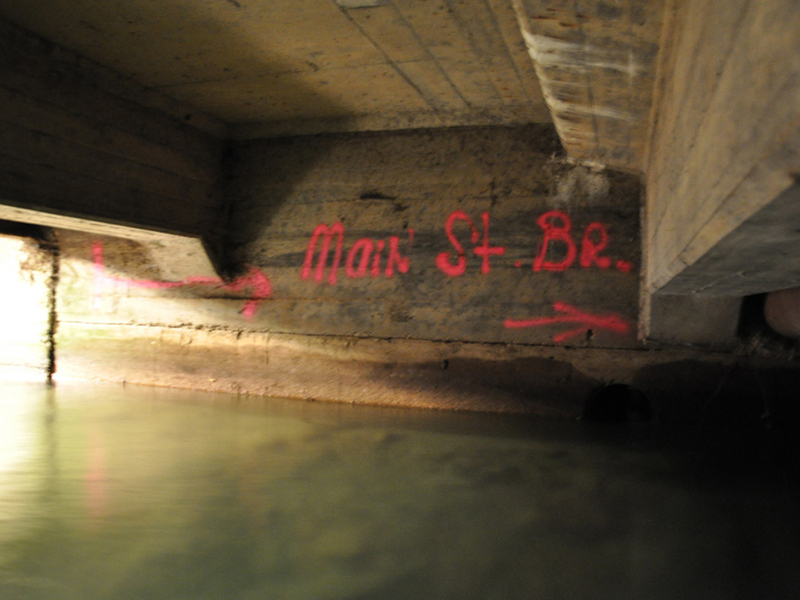 The creek under town isn't the only unique feature of Lewistown. The area also lays claim to Yogo sapphires — the only sapphires in the world that come out of the ground blue, without being heat-treated. Princess Diana's engagement ring was a Yogo, according to JoAnn Bristol of Moccasin Mountain Art Gallery. "I know that every woman in Lewistown has one. At least she should." Near the art gallery is the local Moose Lodge. Tom and Joann Macomber are regulars there and like telling the story of the night Tom got hit by the school bus. Once you start looking, you'll notice Main Streets are everywhere and tell all kinds of stories. There's a Main Street in San Luis, Ariz., which dead-ends right into the Mexican border. The Main Street in Navasota, Texas, is a gravel road in the middle of a field. Main Street is small town and urban center; it is a thriving business district and the prostitution stroll. "I was drunker than a billy goat," Tom says. He'd just finished a greasy diner breakfast of steak and eggs after a night of pool. It was around 2 in the morning and he was hobbling across the street on his crutches and one leg. He hoped to bum a ride home from Joann, who was tending the Moose Lodge bar that night. That's when the bus hit him. The bus driver knew something was wrong. "And then she backed up to see who the heck she hit," Tom laughs. "And I said, 'I'm going to buy you a glass bottom so you can just look through and know who you runned over, you don't have to run over them a second time.'" The local guitar shop is just down the street from the Moose Lodge. The owner crafts guitars for Isaac Brock of Modest Mouse. Felicia sometimes volunteers there. "I'm a teenager. I'm 18 years old, so obviously I'm looking for something a little different, because I've been in Lewistown my whole life," Felicia says. "But I respect this town." Felicia says her next plan is to hitchhike for a while and see where that takes her. But, she adds, "I think no matter where I go, I'm always going to come back." Mapping Main Street is produced by Ann Heppermann, Kara Oehler, James Burns and Jesse Shapins. This Mapping Main Street story was also produced by Ian Gray. Additional help from Josie Holtzman and Sara Pellegrini. Mapping Main Street is a part of MQ2, an initiative of AIR, the Association of Independents in Radio, Inc. with support from the Corporation for Public Broadcasting. The project is also supported with funds from the Berkman Center for Internet and Society at Harvard University. Participate in this open documentary project by contributing stories, photos and videos of Main Streets across the country. Visit mappingmainstreet.org to join in.